Genetic Technologies Ltd. (GENE) spiked 85 percent today to $5.86 after climbing to $6.95 earlier, the most highest intraday price since its 52-week high ($6.94) set on January 9. The Fitzroy, Australia.-based company announced after the bell Tuesday that it gained certification of its Australian laboratory, under the U.S. Clinical Laboratories Improvements Amendments regulated by the Centers for Medicare and Medicaid. The certification completes the requirements for the U.S. launch of the BREVAGen breast cancer test. Technically speaking, GENE gapped open higher Wednesday and has continued to rise sharply on strong volume. Just over halfway through the trading day, more than 2.5 million shares have already changed hands, compared with a three-month daily average of just 79,000 shares. The day’s trading range for the ticker has been between $4.86 – $6.95 per share. Genetic shares have already begun to fall off the highs of the day — momo players must be careful here as the equity is quite extended intraday and could be due to pullback — so short-term, I would beware of this price spike. 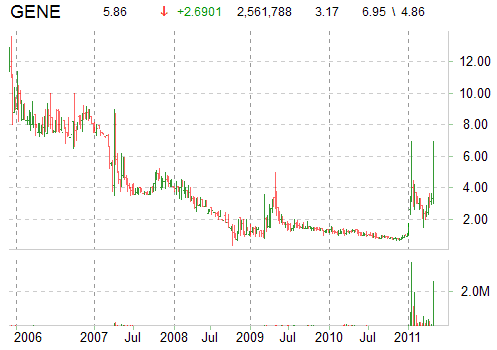 Resistance for the shares of GENE on this parabolic move is at $8.00. Without a sustained buying however, the equity will remain vulnerable in terms of sustaining the current PPS. Keep in mind, while there is definitely good intraday strength, the fact is the ticker is currently being propelled higher only by a significant amount of momentum. In addition, today’s move certainly doesn’t appear to be driven by fundamentals. GENE has a negative 1-year return on equity and profit margin of 18.71% and 10.07%, respectively. Quarterly rev growth: y/y (-17.00%). At last check, GENE shares were up $2.80, or 88.33%, to $5.97.